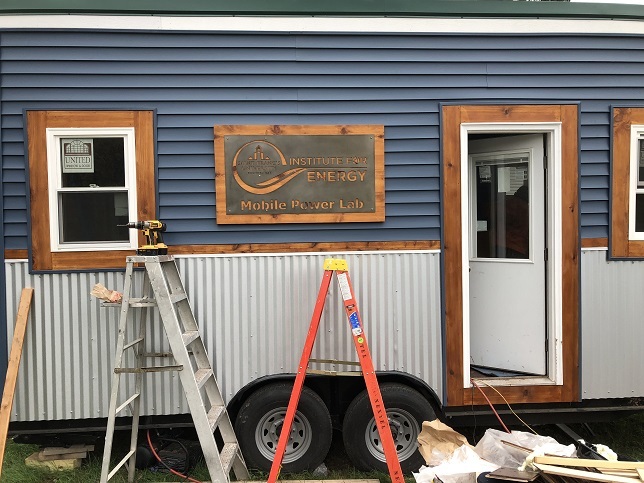 The Saint Francis University Institute for Energy's tiny mobile power lab serves as an educational resource for SFU students and surrounding communities. 1.68 kW (6x 280 watt panels) on the roof provide electricity to this off-grid unit. AGM lead acid batteries store the energy generated by the solar panels until it is needed. High efficiency 4 watt bulbs in this fixture provide lighting to the middle of the classroom. An EPA certified low particulate matter emissions wood pellet stove provides heating to the unit. 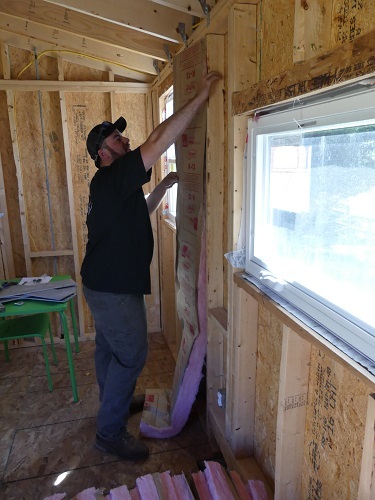 Foam spray, foam board, fiberglass, and mineral wool are visible in a see-through wall behind the white board. The inverter converts direct current (DC) generated from the solar panels to alternating current (AC) commonly used by appliances. A small wind turbine blade and other wind related materials are housed in the classroom. The tiny classroom has received significant attention from local, state, and national media outlets. Examples have included the Altoona Mirror, Johnstown Tribune-Democrat, Explore Venango, Allentown Morning Call, tinyhousetalk.com, Utility Dive, U.S. News & World Report and many more. The tiny classroom project has "been selected by the Department of Environmental Protection (DEP) to receive the prestigious 2019 Governor’s Award for Environmental Excellence." It was one of 17 projects selected this year. "DEP evaluated projects for their degree of environmental protection, innovation, partnership efforts, economic impact, consideration of climate change, and sustainability and results achieved," according to the award webpage. Students from area high schools visited the tiny classroom for SFU Science Day. This marked one year since our first guests visited the unit for Science Day 2017. An open house was held on the day of SFU Football's game against Bryant. Hooray for the win! The mobile power lab visited the East, Middle, and West campuses of Divine Mercy Catholic Academy to provide an introductory lesson to new Sustainability Lab & Library curriculum for the Pre-K to 8th grade students. As part of SFU Merit Badge University, scouts participating in the Sustainability Badge program visited the tiny classroom to learn about renewable energy and discuss how tiny spaces can result in having less stuff. Shoppers at the Somerset County Farmers Market had the unique opportunity to browse fresh produce and locally produced goods while also visiting the mobile power lab. Third graders from Berlin Brothersvalley School District heard a renewable energy presentation before a trip outside to the tiny classroom. Despite the rain, students enjoyed learning about solar and wind energies! The Institute welcomed Constellation, an Exelon Company, to Berlin and our Loretto campus to shot a video about the tiny classroom! We visited the Berlin Community Makerfaire focused on STEM activities. The Cambria County Solar Co-op held an information session at the university, which included a visit to the tiny classroom. The tiny classroom visited the East and West Campuses of Divine Mercy Catholic Academy for meet the teacher nights (click for pictures). We engaged several hundred interested parents, teachers, and students during tours of the tiny classroom's energy and sustainability features! At Parker Dam State Park, the tiny classroom joined electric vehicles, sustainable building, wildlife, and farming displays and more! Students in SFU Kids' College's 123 STEM and Flight and Space Camps visited the tiny classroom. Students in Energy Camp visited the tiny classroom to learn about solar, wind, biomass, energy efficiency and more. Robotics camp joined the campers for a treat - popcorn popped in our solar-powered microwave. Students participating in SFU summer camps Build It Better and STEM K’NEX Camp & Robotics visited the tiny classroom to learn about building a tiny, sustainable classroom. They also saw various examples of solar energy in action. At Energy Camp: Supercharged! at Divine Mercy Catholic Academy, Johnstown, student participants had the opportunity to visit the tiny classroom as part of a three-day Institute led event focused on all things energy. The mobile power lab visited Penn State Energy Days in State College on May 30. At Quantum Quest Fest 2018 held at the Greater Johnstown Career & Technology Center, area elementary school students engaged in a variety of space related activities. At the solar-powered tiny classroom, students learned about the sun and how space satellites often use solar power. In addition, students visited a station to talk about wind energy, including the planet Neptune, which has the fastest winds in the solar system! Later in the day, students from the GJCTC's Electrical Technologies program toured the classroom to see solar energy in action. 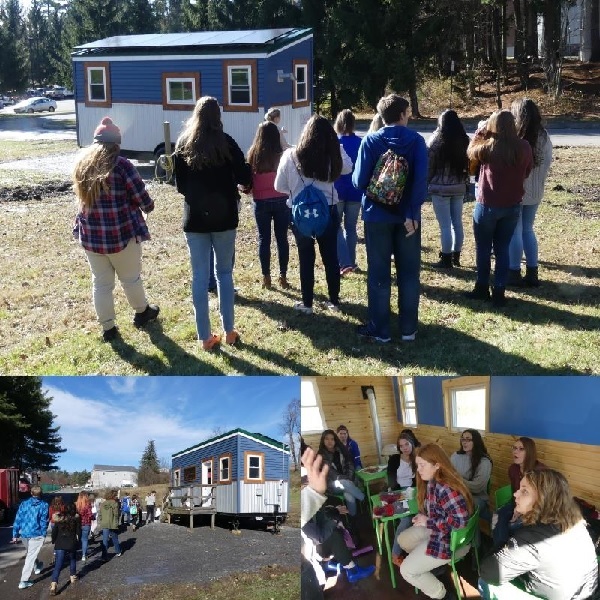 At Bishop McCort High School and Divine Mercy Catholic School, Johnstown, students were able to tour the tiny classroom. WJAC-TV visited to film a segment about the unit. A group presentation began the day for K-6 grade students at Hope for Hyndman Charter School, Hyndman, before each class came to tour the unit outside of their school. An image from the visit was published in the Bedford Gazette. The annual Earth Day Carnival at SFU brought members of the campus and surrounding community together to learn about and celebrate the Earth. 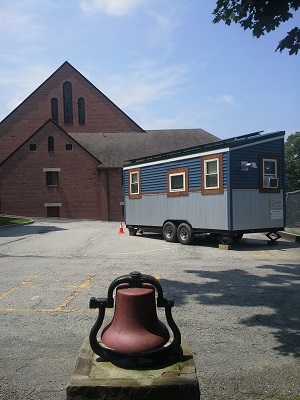 An open house for the tiny classroom was held. Students from Holy Trinity Catholic School, Altoona, visited the tiny classroom in the parking lot of their school. 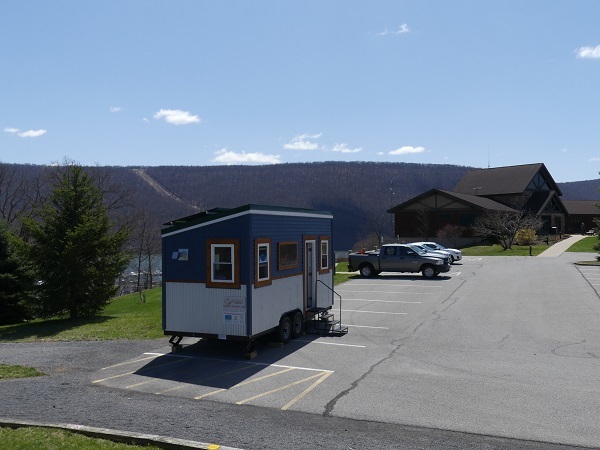 The mobile power lab was part of the Earth Day Sustainability Symposium at the Raystown Lake Visitor Center in Huntingdon County, PA. Students from Juniata Valley and Huntington Area School Districts participated in various activities, including a visit to the classroom. The Institute received $30,000 from the A. J. and Sigismunda Palumbo Charitable Trust for the tiny classroom project. Pictured are representatives from the Palumbo organization along with Institute staff during a check presentation on April 18 in St. Marys, PA.
Students and staff from Juniata Valley High School came to Loretto to visit the tiny classroom. We welcomed students and staff from Seton LaSalle Catholic High School to the tiny classroom in Loretto! It's a snowy December day in Loretto, but the pellet stove is keeping us warm! An article about tiny spaces and featuring Saint Francis' tiny classroom appeared on the front page of today's Altoona Mirror! It has been picked up by the Associated Press and published nationally by a number of news organizations, including the Pittsburgh Post-Gazette, Centre Daily Times, Chicago Tribune, Washington Times, Houston Chronicle, Miami Herald, Seattle Times, Los Angeles Times, and U.S. News & World Report. To help support the unit traveling to schools and events around the state, the SFU Institute for Energy was recently awarded a $20,000 grant from Constellation, an Exelon company. The tiny classroom/mobile power lab is complete and just arrived on campus! What a transformation! We are excited to host our first group of students through it next Tuesday for SFU Science Day. Let us know if you'd like it to make a stop at your school or event. HUGE THANKS to Community Foundation for the Alleghenies and West Penn Power Sustainable Energy Fund for supporting this project! The tiny classroom construction phase is almost complete. The sign is now up! Internally, the biomass pellet stove is working and the solar panels are ready to charge the batteries. We hope to have the unit in Loretto in a few days. The inverter for the solar panels has arrived and been installed by Redstone Renewable Energy, LLC. Now to test the system to see if the panels charge the batteries! The exterior is complete, except for one small spot where the biomass stove will exhaust. We have received the biomass stove and are preparing for its installation. The inverter will hopefully arrive soon so that Redstone Renewable Energy can hook up the solar system to the batteries. We can then finish the front wall. Insulation installation has begun. The exterior of the tiny classroom is almost complete! Two sides are 100% done. We need to install our Thelin Gnome biomass pellet stove, purchased through WESS Energy Saving Systems, and corresponding exhaust pipe before we can finish the back side. The stove and piping have been ordered and are ready for pick up. Because the tiny classroom will use both battery backup and “RV Style” grid tie, we need a special inverter. We special ordered the inverter 12 weeks ago and are still waiting for its arrival. Once that’s in, the 1.56 kW solar installation will be complete and we can finish the exterior of the last side. After the exterior is complete, construction on the interior will commence. Construction is expected to be finished by early November. The project is being built with the support of community volunteers! 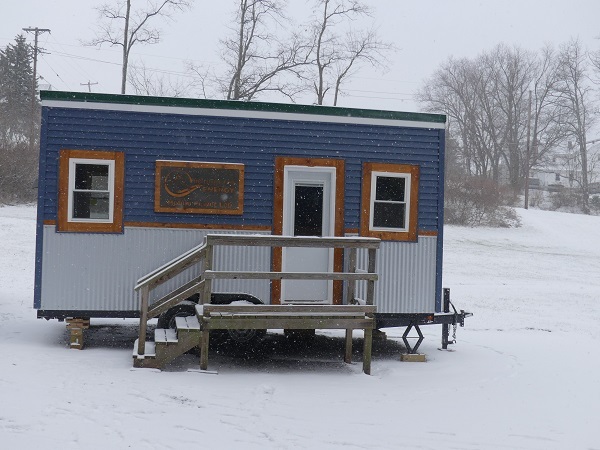 Redstone Renewable Energy, LLC of State College, PA, installed the tiny classroom's solar panels. The six modules combine to create a 1.68 kW solar array. The panels will produce electricity in DC, so an inverter will be used to convert the electricity to AC for use in the tiny classroom. This system will also feature a battery system. We purchased a tiny house shell to turn into the tiny classroom! The West Penn Power Sustainable Energy Fund awarded $23,000 towards the tiny classroom project, including an EPA certified biomass pellet stove. A team of students in the SFU Environmental Engineering program worked with the Institute for their senior capstone project, developing a design that conformed to the Institute's initial concept for the tiny classroom/office. A grant for $19,200 is awarded to the project from the Community Initiatives Fund of the Community Foundation for the Alleghenies. 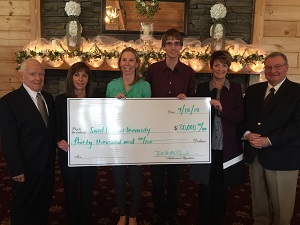 The Penelec Fund for the Future of Greater Johnstown of the Community Foundation for the Alleghenies provides $2,000 in funding towards the tiny classroom project. The idea to construct a mobile energy education space is conceived. Schedule a visit to the unit while you are in Loretto. Interested in the tiny classroom visiting your school or community? Submit your contact information below to let us know! *Please note: While we try to provide outreach to the community as much as possible, our schedule, budget, and the weather may mean we cannot honor all requests for visits from the tiny classroom. If we are unable to make it to your community at this time, remember you are always welcome to come visit us in Loretto. All requests that we cannot fulfill will be added to a waiting list.